6.5 million homes in the UK are still without an efficient thermostat¹. Also, a brand-new Building Research & Information report on ‘How installers select and explain domestic heating Controls’, conducted by University College London, has revealed that there is still a lack of understanding amongst homeowners on how to use heating controls, and a misconception that in order to realise energy savings, ‘occupants must actively program their thermostat and select settings which result in energy efficiency’². And it’s just as easy to install in three simple steps – wire, power up and test and finally, configure – before it’s ready to handover to the homeowner. A new wireless receiver box, redesigned with a flip-up wiring bar for easy installation also makes the wiring process more accessible than ever before. The T4 is compatible with any boiler and has ease of use and installation at its core, created to simplify home temperature scheduling. The thermostat is available in three models: the T4 standard, wired model, ideal for retrofit solutions; T4R wireless version with OpenTherm control via the receiver box offering an easy switch over from an existing wireless receiver box; and the T4M, wired modulating version with on-screen OpenTherm boiler information for additional user control. All models have 7-day 5/2 day & single day programming with a host of features making the T4 the best choice for a simple solution. The T4 is suitable for domestic and light commercial applications and is available now from all good plumbing and heating merchants and electrical wholesalers. 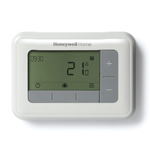 For more information, please visit http://www.honeywelluk.com/products/Programmable-Thermostats/.